The Wolfpack pose with their trophy after winning the fourth grade house title. 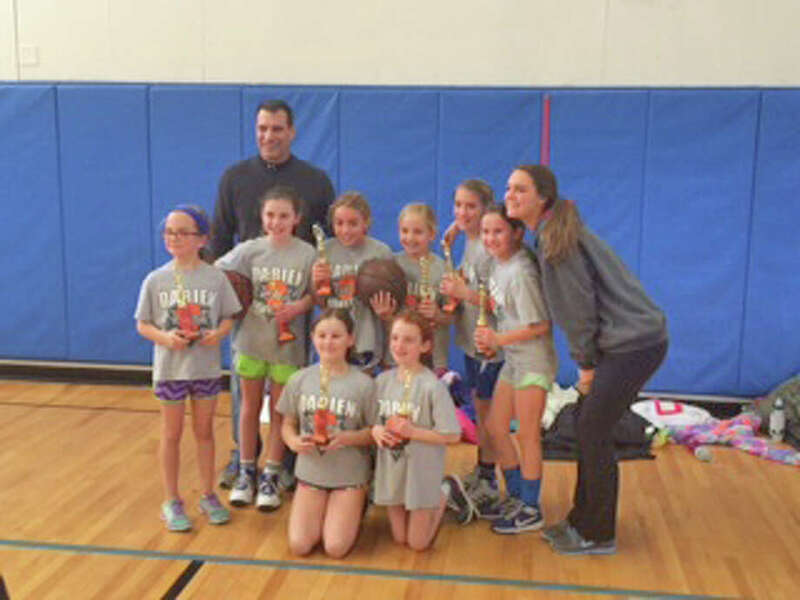 The fourth grade girls house basketball playoffs entertained the fans at the packed Royle school gym with last second shots and great defensive stops, but in the end the Wolfpack swept thru the competition with three straight wins to take home the crown. The top seeded Wolfpack took on the Eagles first and defeated them by the score of 20-9 with a smothering defense and balanced scoring. Sophie Smith (four points) and Kathleen Pritchartt (four) had key baskets to help extend the lead in the third quarter. Brynn Karczewski (four) and Katelyn Secor (led all scorers with eight) worked the fast break beautifully to put the game out of reach. The next game proved more challenging with a hard fought 25-17 victory over the Blue Devils. The Blue Devils kept it close through three quarters with Chloe Humphrey scoring 10 points but in the end the strong defense and rebounding by the Wolfpack resulted in six unanswered points in the fourth quarter. The Championship game did not disappoint the packed gym at MMS. With the underdog Hurricanes having played at 8am to get into the final and head coach Doug Quayle unavailable for the game, the Hurricanes came out firing to take a 6-2 lead after the first quarter (Emma Quayle two points, Payson Hedges two and Kathy Kahn two). Josephine Olmstead pulled the Wolfpack closer with a nifty put-back to make it 6-4 at the end of the half. Down 7-6 late in the third quarter the Wolfpack drew up a play that was executed perfectly by Lucy Duggan, Audrey Komminsk, Josephine Olmstead, Katelyn Secor and Brynn Karczewski resulting in a baby jump shot for Karczewski. The Wolfpack took the lead and did not look back and secured the trophy with a 13-7 win. Brynn Karczewski led all scorers with nine points and Katelyn Secor chipped in two. It started out tight in this playoff game between the Bulldogs and the Huskies but the Bulldogs scored 10 points late in the second quarter and maintained their lead the rest of the way. Maggie Moffatt led the way for the Huskies with five points and Anna Corbett handled the ball well throughout the game. Diana Degnan, Leah Nault and Ameilia Doll all chipped in a bucket each and multiple rebounds as well. The Bulldogs were led by Elena DeGennaro who scored a season high eight points. Hope Zimmerman and Gigi Skolds both blocked shots on the defensive end and Gigi chipped in four points. Olivia Gasvoda handled the ball like a pro and forced several turnovers. Emma Blenke and Sophie Larizza each drained long range shots for important points and Maddie Connors was a rebounding machine on the offensive side with four points on key put backs.